I had missed the first issue of the TEEN TITANS revival, and I skipped the second (though i recall seeing it on the stands at the time–there must have been other books that I wanted more) but with this issue I finally took the plunge. Kid Flash’s prominent placement probably didn’t hurt. It must be said, the inking on this Rich Buckler cover by Frank McLaughlin is painful, the faces in particular. Inside the issue, the artwork way better, if not spectacular. DC mainstay and regular FLASH artist Irv Novick handled the penciling, which put it well within my comfort zone. 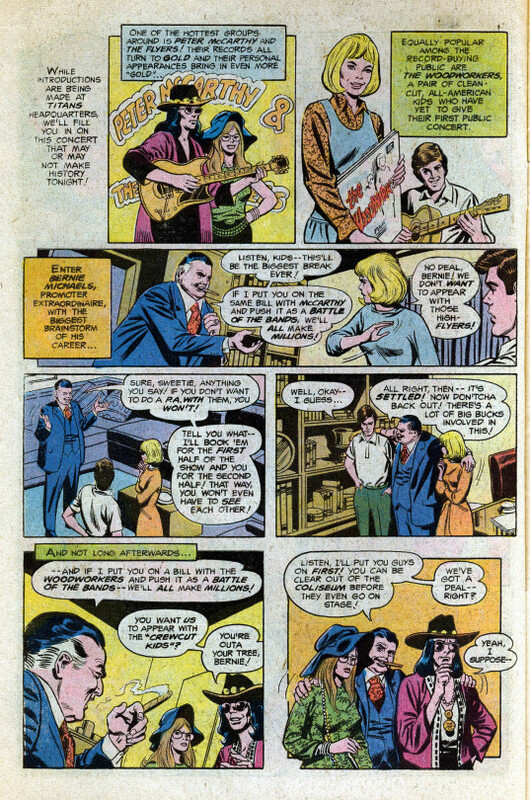 Novick had been in the business since the 1940s, helping to create the first patriotic super hero, the Shield, for MLJ (later Archie) He was a consistent craftsman and a fixture within the DC titles of the 1970s. In addition to achoring FLASH, he was also a regular contributor to BATMAN, where he’d channel as much of Neal Adams’ popular approach as was possible. The story opens with an attack on a Coliseum (clearly meant to be Nassau Coliseum but never specified as such) where a Battle of the Bands will be held, by the Fiddler, and old Jay Garrick Flash enemy from Earth-2 now mysteriously on Earth-1. 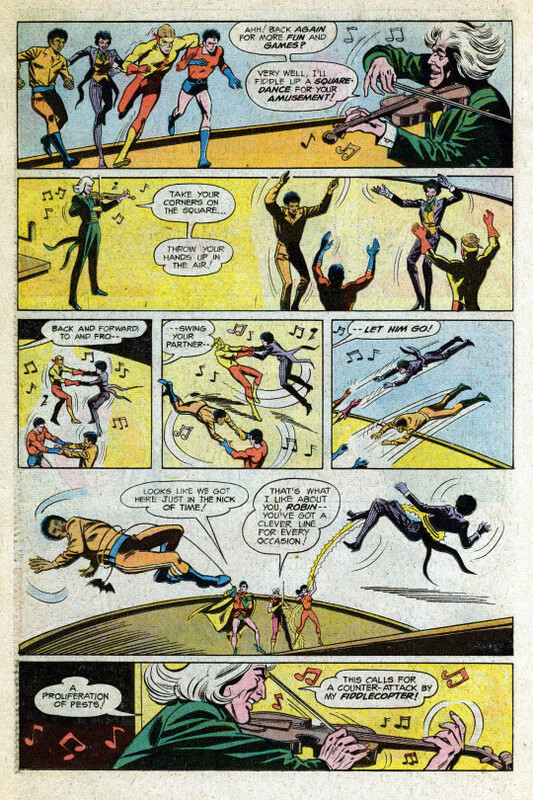 Speedy and Mal happen to be on-site and engage the Fiddler, but they’re stomped all over by the mesmerized crowd while the villain makes his withdrawal. 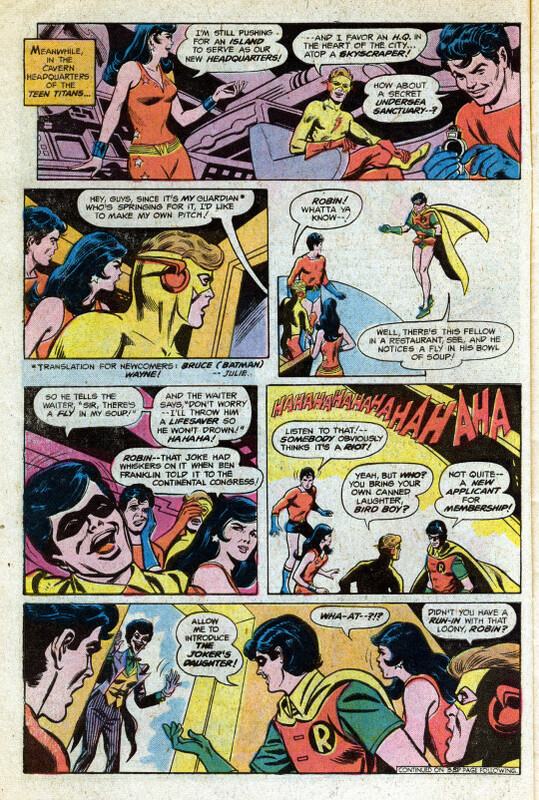 Back at Titans HQ, writer Bob Rozakis makes good his promise in BATMAN FAMILY by having Robin introduce the Joker’s Daughter to the group as a candidate for membership. I wonder if the continuation of this plotline may have been the tipping point that convinced me to pick up this issue. But the crux of the story revolves around the aforementioned Battle of the Bands, a musical throwdown between a pair of disparate musical groups: Peter McCarthy and the Flyers and the Woodworkers, each of whom represent broad parodies of similar real-world musical groups of the era. Despite the fact that their music appeals to different crowds altogether, their common management has put together this Battle of the Bands as a promotion to attract the crowds–and it’s also attracted the attention of the Fiddler, who abducts Peter and Laura McCarthy. 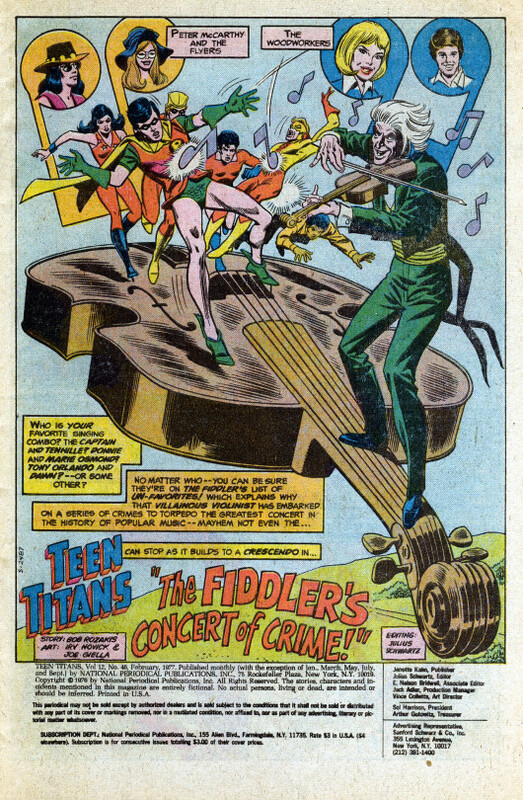 The main Titans team finds the Fiddler back at the Coliseum, where he’s mesmerizing the crowds again with his hypnotic music. But despite their best efforts, the teen heroes muff the job and wind up taking one another out, once again allowing the Fiddler to escape, his plan to foil the concert undiminished. 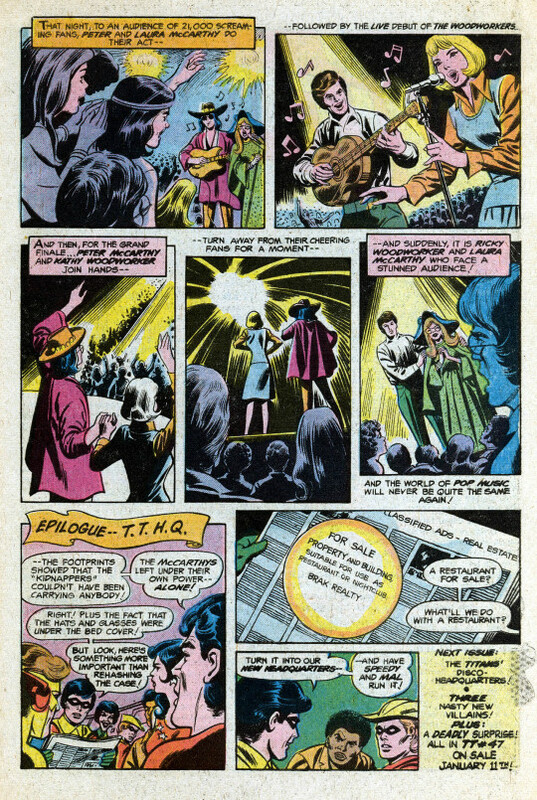 Elsewhere, Robin and Aqualad along with the Joker’s Daughter investigate the kidnapping scene, where they find among other things the floppy hats and sunglasses worn by the McCarthy’s. But before Robin can finish his deductions, the trio is teleported to the rest of the team by Mal. Now the Fiddler has kidnapped the Woodworkers, whom he’s holding for ransom mesmerized atop the Coliseum. The Titans fly to the attack, but again one old man with an enchanted violin makes monkeys of them. 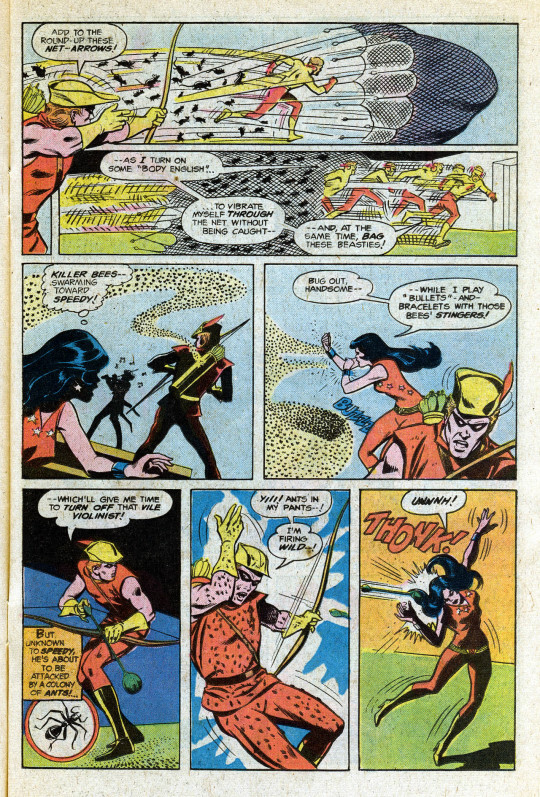 As one by one the Titans are taken out of the fight, the Joker’s Daughter comes to the fore, using her humor-based gimmicks to get the upper hand and kayo the Fiddler, thus earning her spot on the team. And the big payoff, of course, is that Peter McCarthy and the Flyers and the Woodworkers are the same band! They’d been performing under two separate identities for years, and when they were roped into doing a concert with themselves, they staged their own kidnapping to get out of it, figuring that the Fiddler would be blamed for it after his first attack. But now, they have to face the music, and reveal their secret in front of their stunned audience. The text features in the back of the issue were both of interest to me. First, the letters page featured the second half of an index of all of the Teen Titans’ previous adventures. I loved these sorts of things and would eventually write up my own indexes of different comics I was reading. 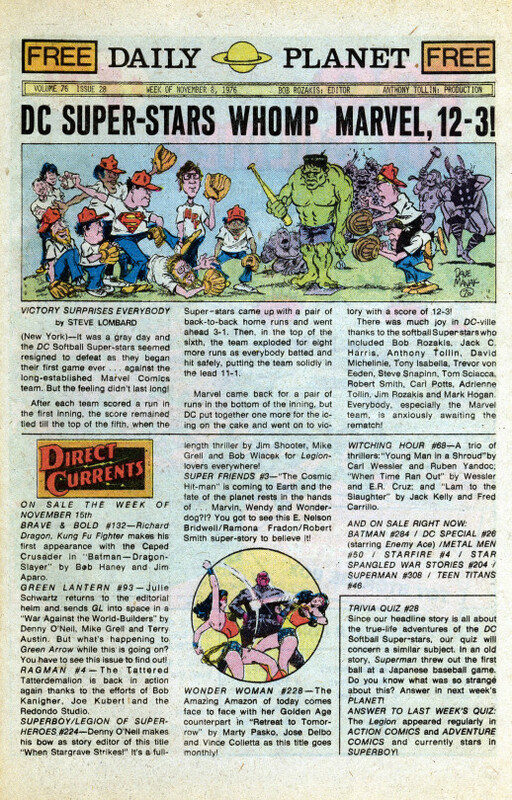 Then, the Daily Planet promo page spotlighted a softball game between the DC production crew and that of their rivals at Marvel–a game that DC won in this instance. Dave Manak did a great cartoon that illustrated the top of teh page in humorous style, one that showcased the Marvel characters far more than those of DC–something I wasn’t used to seeing in a DC title.